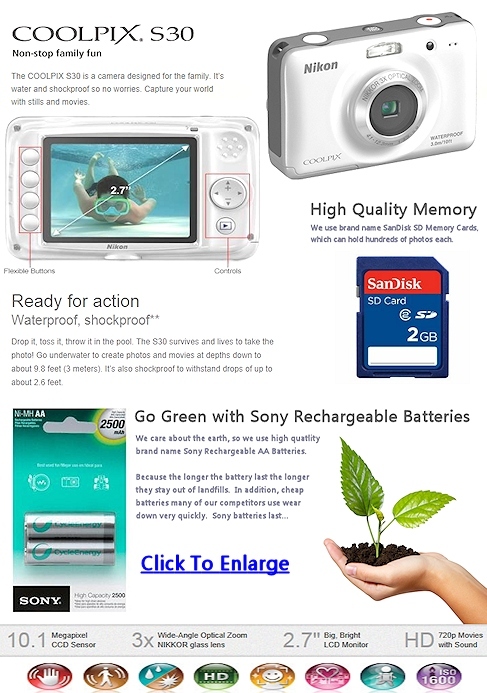 Here at WeddingsCenter.com, we have been selling lovely disposable cameras from weddings to Sweet 16 parties, and even golf outings for the past 9 years. Because technology along with cameras has changed so much over just the past few years, we have recently started offering digital cameras instead of disposable, single use cameras. We were very careful and choosy about the brand, quality and reviews that made our decision on using the digital Nikon CoolPix cameras over other styles and brands to rent to our customers. We needed cameras that were both durable and dependable. There are so many benefits to renting our digital cameras as opposed to buying disposable cameras such as the lighting, unless your gathering or reception is outside during the day most party and reception areas have dim and soft lighting for elegance, and for when the DJ and dance floor lighting begins. Dim lighting can be a very big negative for traditional film cameras, as you can see in the example below. The film cameras can come out grey and grainy and simply really hard to see the picture, basically the picture is disappointing. In addition, rain and moisture will destroy a camera if you are having an outdoor event. Yet, our digital cameras are waterproof, so you won't have to worry about the weather. If you purchase 10 of the traditional disposable cameras at 27 exposures each, this will of course give you 270 pictures, while our Nikon digital cameras can hold well over 100 photos each. Now subtract the silly photos such as someone accidentally taking a picture of their shoe, or as explained above the dark grainy pictures, or pictures that people take that you really can't figure out why they took them could take you down to 200 photos or even less. It's also easy on disposable guest cameras to miss that no time to waste picture such as the groom unexpectedly sweeping his bride up off her feet and giving her a kiss, with the film cameras you have to wait for the flash to get ready so by the time it's ready to take the picture the moment has passed. Not only what was just explained could happen, but the picture could come out blurry due to the quick movement. Another great feature of our cameras is that they have a 2.7" LCD screen so they can check the photo immediately to make sure everyone was not blinking, accidentally making a silly expression, or to even make sure the shot came out correctly. To see more of the description and features of these elegant cameras, we have a full layout on our product description below, which you can click to enlarge. So now at about or around $.28 a picture to develop traditional film with 10 cameras at 27 exposures each you're looking at about $75 to develop the pictures, and those are only for you, in other words how would you share them with the guests that came to the event and took the pictures? With our rentable digital cameras your guests can take hundreds of pictures on each camera, and we upload them to our site for 30 days for you and your guests to enjoy. Another great benefit to these digital rental cameras is you only print the pictures you want, I mean yes of course it's nice to print your favorite pictures and make a photo album out of them, but it really seems like a waste of money to print pictures you don't want to put in a photo album that would otherwise sit in a shoebox such as the caterer setting the food up. When you receive the cameras they will already be set on simple point and shoot mode which optimizes the camera automatically giving the best results for the pictures, what this means is the camera automatically knows how to adjust itself for light, motion and such. Plus, they are 10.1 Mega Pixel while most of our competitors are only 8 Mega Pixel, which is a 20 percent difference in pixel resolution. Not only that many competitors use subpar memory cards and cheap no name batteries. We use high quality name brand 2GB Scan Disk SD memory cards, and high end Sony CycleEnergy Rechargeable AA batteries. All of these differences make for a better quality product. Plus, you don't have to worry if you get our cameras wet, because they are waterproof. WeddingsCenter.com has enjoyed helping brides, grooms and party planners for many years to add the extra captured moments that they may have missed or never even knew about, and we want to continue doing so along with the digital times. We feel that it is of most importance to continue giving the customer service our customers deserve by renting them these high quality the digital cameras. We will of course continue to carry the beautiful disposable cameras because we know not all gatherings and events will have a huge guest outcome such as small baby showers, bachelorette parties and small birthday parties. Therefore cameras such as the disposable rhinestone cameras which are great for any event will still be the perfect asset in capturing all the memories you can. Another added bonus with our Nikon CoolPix S30 Digital Cameras is that they make a nice little added decoration to your tables with their white shells and table cards with user instructions. Simply leave a camera on each table with a table tent instruction card letting them know how to use it. These cameras can also be used to record memories from the entire wedding process leading up to your big day. Take photos of everyone getting dressed and ready for the big day, the rooms before decorating, the decorating process, and most of all family and friends.